KCS GROUP - For All Your Commercial Vehicle Needs! In 2009 Marshalls came to KCS group to redesign their delivery trailers. The old drop side panels were heavy, cumbersome and expensive to keep repairing. They wanted a lighter, easier way to protect their load but also allow their drivers safer, easier access to offload once at their drop off point. Our re-design has now been implemented by several large trailer manufacturers over time. On the 22nd July 2009, KCS Group held it's grand opening of the new premises. Attended by many customers and suppliers, the opening was a great success. With champagne flowing, British Superbike Champion, Leon Camier, officially cut the ribbon on the new building declaring it officially open. Back in 2003, KCS bought a one and a half acre site opposite the original workshops in order to redevelop it at a future time. Well the time has come. In June 2008 building work began. Shortly after the groundworks had finished, the steel structure arrived and was up within a couple of weeks. By Christmas the building was water tight and secure. The perimeter fencing was in place and most of the block paving had been laid in the trailer parking area. With first and second fix completed by February, the completion date was set. The official hand over of keys occured in June and after a new computer system was installed, the office was moved. At the same time the Stores were also being moved in just below the office. The new building became fully operational at the end of June and with that, the lights went out in the old building. 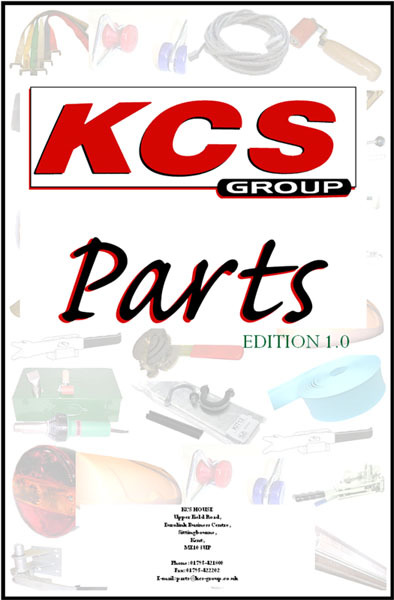 Back in 2008 KCS started a seperate parts department. Tasked with sourcing all trailer and body parts at the best possible prices, We have been able to offer a multitude of parts at very competative prices to new, as well as existing customers. We also have been using a major carrier to offer our customers a nationwide next day service. A 'before 9am' service is available if required. Having spotted a gap in the market for a one stop shop, covering all makes of bodies and trailers, we believe we can save most people money, time and effort when they need to order replacment parts. We can ship to all parts of the mainland UK and smaller offshore islands if required. We can also ship WORLDWIDE! For some time now, we have been putting together a catalogue of parts which will help our customers to quickly identify the parts they require. When used in conjunction with our parts website, you will be able to see a large selection of parts which will enable an easier task of ordering.